During the summer of 1998, our family faced the sudden death of our twelve-year-old son. He was perfectly healthy that morning, but during the night, his airways had a spasm and closed up. We discovered him blue and not breathing. I said “faced” because we came face to face with death; waiting for medical help, not knowing if our son was still alive at one point. It turned out to be a one-time seizure. He regained consciousness and suffered no lasting effects. The shock of thinking I would never see my son again in this world turned into a relief that is still with me fourteen years later. The next morning when he was still with us, we understood that for many parents, it does not turn out to be just a scare. We had just a glimpse of death and it was ultimately a blessing. It pulled away the veil of denial that bad things only happen to other people, and brought life into clearer focus. Everyone should have such a blessing. 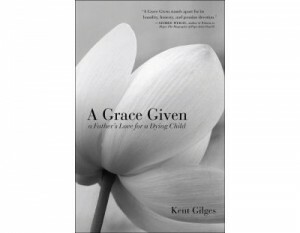 In his book, A Grace Given: A Father’s Love for a Dying Child, Kent Gilges gives us such a glimpse. The story of loving and losing his beloved first child, Elie, is less about loss and more about gaining in wisdom, in strength, and in a greater capacity to love. For Elie, death did not come suddenly, only surely. Elie was eight months old when she was diagnosed with an inoperable brain tumor. Kent and his wife Elizabeth grieved intensely but accepted the prognosis of anywhere from a few days to months before the tumor would take over. They determined to surround Elie with love while they waited. Hope was renewed when they found two brain surgeons with the skill to remove such tumors. Then, Elie had a stroke as a result of the surgery. For the next nine years, she survived with minimal brain function and needed continuous care until she died at the age of ten. Through the process of the long good-bye, Kent was transformed. “My children are the greatest gifts I have known,” he wrote while caring for her, “but Elie is particularly special. She makes my life far richer, more contemplative, and more full of joy than it ever would have been without her. She is a beloved—even essential—addition to our home and will be as long as she is with us.” His story tells of coming to understand suffering’s noble beauty as a gift from God, something he said was hard to explain to one who has not experienced it. The book is written so masterfully that we actually do experience such suffering as Kent’s thoughts and emotions vicariously become our own. Elie becomes our child too. We come to love her and hate losing her along with Kent and Elizabeth. For nine years, Kent said good-bye but really it was a hello of sorts to parts of life he had never encountered including God. Kent, described himself as a recovering agnostic and as such, he had not properly introduced himself to God. Elie made the introductions. Instead of anger at God’s choice for them, Elizabeth and Kent opened their hearts to stirring revelations. “We spend our lives dying, but the process of dying is what gives life its poignancy, its beauty, its joy,” he wrote. They went on a pilgrimage to Lourdes and even met Pope John Paul II in search of healing and the acceptance of God’s will. Elizabeth was a cradle Catholic whose faith was at her center. Kent entered the Church after he wrote the book. Did Elie have something to do with that? I don’t know for certain how Kent would answer that, but clearly, her life launched him on a spiritual journey. “Sometimes I wonder if I have not written this book to understand my own faith, or lack of it,” he said. “Perhaps that is at the heart of my search, the core of what Elie is trying to teach me.” He concluded that although God had not answered their prayers for a miracle healing, he instead gave them what they needed, and that was time with Elie. Elie died cradled between her parents—forever their little baby. That night, as they tried to explain her death to their five younger children, four-year-old Hannah asked, “Mom, can Elie do a cartwheel now?” From heaven, Elie can do far more than cartwheels. Kent and Elizabeth believe she has intervened for miracles. Elizabeth has a friend who suffered severe pain after treatment for mouth cancer. Immediately following Elie’s funeral, her friend prayed for Elie’s help and the pain completely disappeared. Elizabeth told another friend who had tried unsuccessfully to have a child for seven years, to ask Elie to pray for twins. The next month, the friend was expecting twins. Why should others want to read this story that belongs to another? Because it is wonderfully written. The pain is cushioned with insight and love. Anyone who has loved and lost will cry in union as they relive their own stories. Those in the midst of long-term care or impending loss will gain strength and comfort. The rest who have never lost a child or faced disability, stand to benefit most—to have access to unearned wisdom, and through Kent’s eyes, to put life into clearer focus. In spite of knowing the ending before you begin, the book is one that is relished along the way. Like life, it is more about the journey in which we know how it ends. But making it beautiful and meaningful along the way is the goal. Kent has accomplished this goal well in A Grace Given. Previous ArticleHas Abortion Lived Up to It’s Promises? The wonderful thing about a book like A Grace Given is that it can open the door of faith to others who struggle. When we wonder how we can be active and fruitful in the New Evangelization, books of active Catholic witness are a good way to go. I would like to add another book to your bookshelf called ‘Graffiti On My Soul’ a spiritual suspense memoir with a particular charism to call out to those who have drifted away from faith, or for those standing on the fringes wondering what it is all about. The late Cardinal Avery Dulles said, “The living testimony of believers rather than philosophical arguments are what is needed today. In former days we focused on ‘how to get to God’; today it is more importatn for us to understand ‘how God comes to us'”. Graffiti On My Soul is such a book. Sometimes in the midst of an ordinary life storms are unleashed that challenge all we know and have believed. Sometimes these are the result of human brokenness, and sometimes they reflect what St. Paul said: “Our battle is not with flesh and blood but with the powers and principalities of darkness”. This is my story–the story of the death of my little sister at the age of thirteen whose life was crowned with a miracle, of my eight years in monastic life, of my departure, marriage and family and how my life spiralled into a nightmare. It is also the story of how light penetrates the darkness, testifying that WE are the living Scriptures being written in our times, and it is in the grit of our lives that God writes His eternal Love Story. I invite you to read it, and to pass it on! Awarded a Readers Favourite Bronze Medal, Graffiti on my Soul is published by Eloquent Books (http://www.eloquentbooks.com/GraffitiOnMySoul.html) and is most easily available through Amazon.